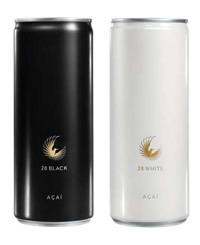 28 Black Energy Drink is known in Europe as Calidris 28 and has been expanding to other markets especially the USA. Unlike most energy drinks 28 Black is taurine free. All varieties of 28 have the same caffeine amount. 28 also produces a line called 28 Drinks that are caffeine free. How Does 28 Black Energy Drink Compare? 28 Black Energy Drink contains 9.46 mgs of caffeine per fluid ounce (31.98mg/100 ml).